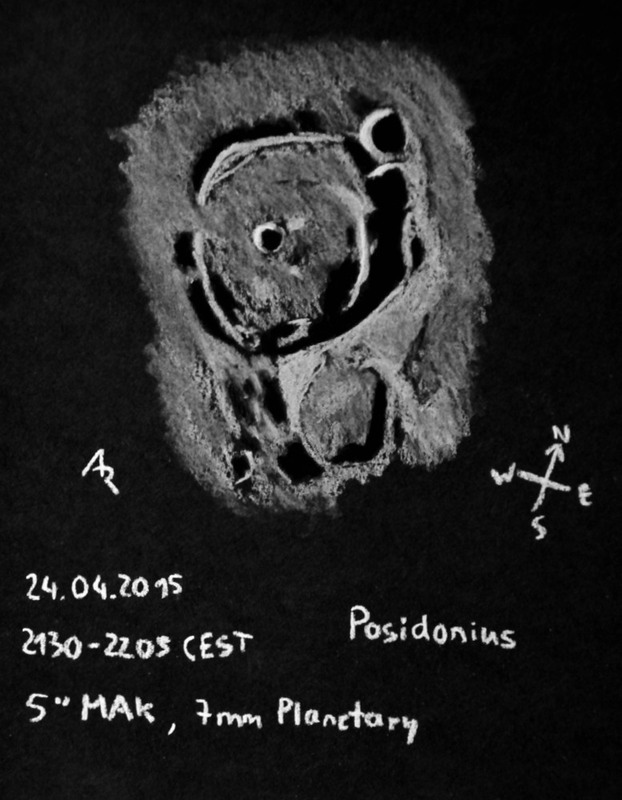 Friday evening just before the altocumulus clouds of the approaching depression covered the sky, I could do another sketch of the moon: This time it was crater Posidonius and its surroundings. Ah, by the way, this time I tried a new pen: For the bright areas (e. g. the western rims of Posidonius A and J), I took a whitecoal pen instead of chalk pen. That provided much brighter contrast. Another novelty for me: I didn’t use a diagonal but an Amici prism, so that the view in the eyepiece wasn’t mirrored at all. The view was a bit less bright, but for the moon it’s still bright enough. An excellent drawing of one of my favorite craters! This is a very fine sketch of a very interesting crater with a tilted floor. I think this is one of my favorite of your sketches. The dark and light areas so dramatic.